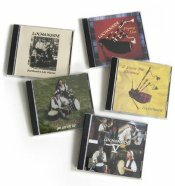 Being that Suzanne, the founder of Highland Secrets, is also the bagpiper in the Scottish group Lochanside, we offer their CD's for sale here. For more details on Lochanside and thier music, including song lists, downloadable song excerpts and ordering information, check out their web site at www.lochanside.com. Ideal for learning or improving playing, this practice Scottish bagpipe is excellent for indoor playing and music sessions with other instruments. Made in Scotland, these bagpipes have the sound and quality of the highland small pipes, yet cost much less. The set includes the bag, blow-stick, chanter, bag cover, reeds, and “brass” drones (one tenor, one bass). 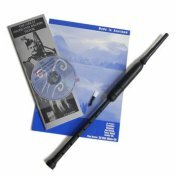 An excellent start to learning to play the highland Scottish bagpipe, this kit includes, a quality chanter, an instruction book with easy to understand diagrams, beginning scottish tunes, and a video C.D. which can be played through a PC, or most DVD players. As fine as this kit is, we still urge a beginner to seek out a competent teacher.